American artist Bill Nelson is best known for his exquisite drawings done in colored pencil. His illustrations and caricatures, published in all the major magazines, have earned him countless awards — over 900 and counting! — including the field’s highest honors. 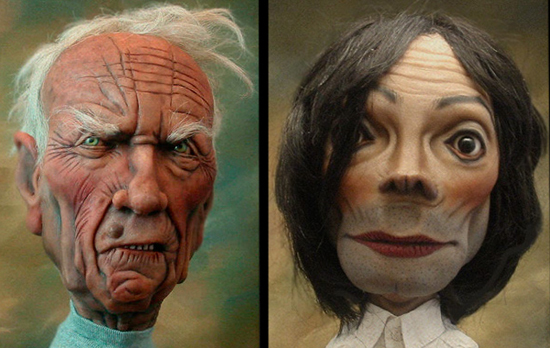 Nelson also brings his bounteous talents to sculpture, creating highly collectable ventriloquist figures, one-of-a-kind dolls and automata. 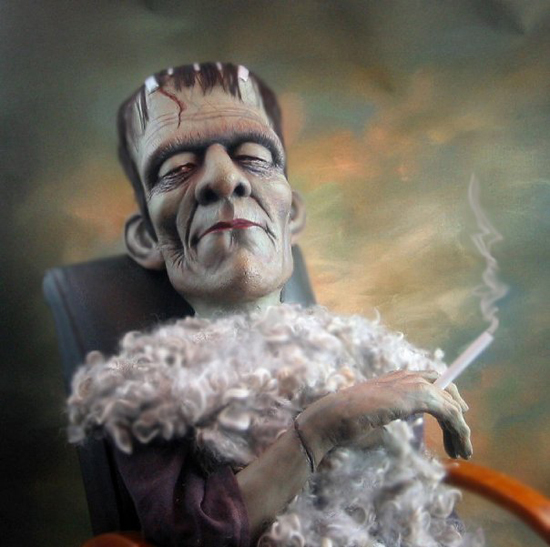 Here, a superb sculpt of Boris Karloff in Monster getup whimsically references the numerous photos of the actor kicking back and enjoying a smoke between takes. Nelson is a Monster Kid at heart, his early but already fully accomplished work appearing in genre magazines of the Seventies such as Photon, Gore Creatures and Cinefantastique. I urge you to click around Nelson’s exhilarating website and look for his illustrations of silent star Lon Chaney, or his portraits of the characters from Tod Browning’s Freaks. You’re in for quite an experience.